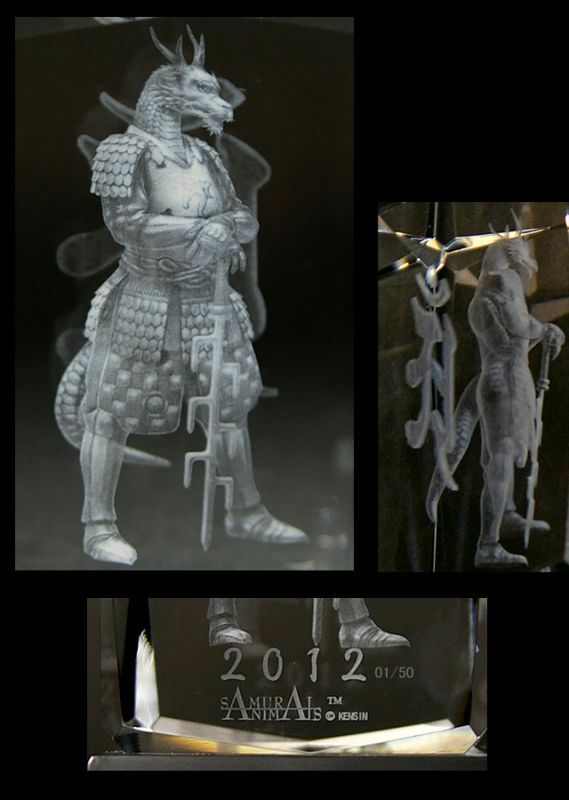 For 2012, the Year of the Dragon, we are proud to launch the first product of the Premium Laser Crystal Figure Collection, the SAMURAI ANIMALS- Blue Dragon. The images that produce this fine product are made up of millions of tiny dots produced by a high performance laser engraving machines imported from Italy. Compared to other crystal figure products, you will be surprised at the high level of detail of Blue Dragon. 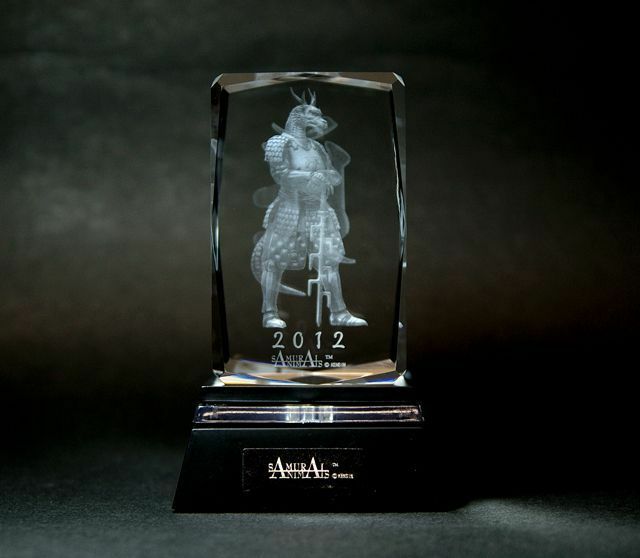 Every feature is well represented, especially the armor, and we believe you will enjoy the authenticity and outstanding design of this product. This character, Blue Dragon, is a general who leads a group to fight against the White Tiger in the original epic saga, SAMURAI ANIMALS, a rich tale which centers on the 12 Animals of the Zodiac, who are divided into two opposing groups led by Blue Dragon and White Tiger. SAMURAI ANIMALS is a chronicle that goes beyond space and time. The trilogy starts in the past, continues to the present and progresses into the future. A character card is included with the Blue Dragon laser crystal figure. Other details regarding the story will be announced at a later date. 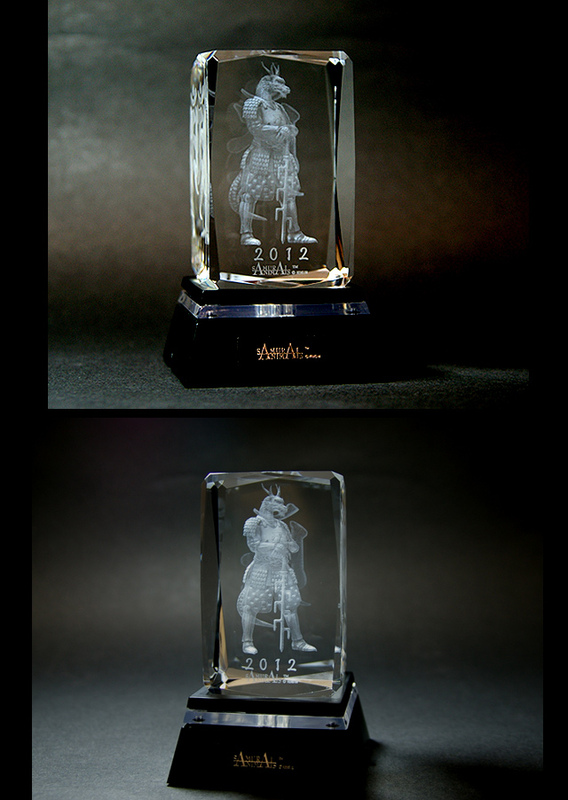 (2) There is a Sanskrit character for "Dragon" etched on the back of the crystal cube.